BRUDEN provides a cost-effective alternative to hiring additional administrators, or arranging for multiple consultants based on operating system expertise. For various operating system environments our System Operational Support (SOS) team will augment current staff and (optionally) can be used to handle multiple environments with one virtual addition to your staff (full or part time). 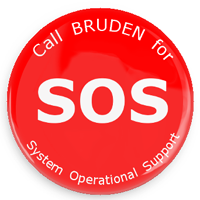 Depending on what is requested or needed, the SOS team can be any one or more of multiple BRUDEN personnel thus providing the ultimate in flexibility based on your immediate requirements. We recognize that many customers have heterogeneous environments where there are multiple operating systems and software packages in use concurrently. The SOS option enables system administration augmentation without needing separate personnel for each operating system environment. The SOS team will normally be active hourly. The SOS agreement is usually for a year, with a specified count of hours to be utilized each month. Arrangements can be made for the longer term, and for any support focus (such as performance, crash dump analysis, or application source code support). An alternative to a yearlong SOS agreement is a BRUDEN-Block "pool of hours". This pool of hours can be used for any services that the customer requires, and on any machine. The block of hours is purchased up front, and will expire after a year. Have the BRUDEN team add expertise on demand to your current system administration team. Have the BRUDEN team analyze your current system configuration and performance, as well as patch and firmware levels. Upon request, the BRUDEN team will work alongside existing administrative personnel to assure a stable and effective system configuration is in place on your systems. Upon request, the BRUDEN team will implement performance enhancement suggestions. We will work with your DBA to ensure correct configuration and performance of Oracle databases. We will work with your SAP personnel to ensure correct configuration and performance of SAP environments.